Deluxe Edition Back In Print! Now there are TWO editions of the Standard Size pack! A Black & White edition of our illustrious card deck is now available. This deck showcases the stunning original black & white collages that were created to make the Tarot of the Holy Light. Comes in a black & white tuck box with revised little white book. Color edition comes in a full-color tuck box. Standard size packs are slightly smaller, 2.75 x 4.75 inches. Printed on 300 gsm (smooth) card stock with our new design on the back. Copies signed on the outside of the tuck box. Or choose the option to buy the book and deck together! 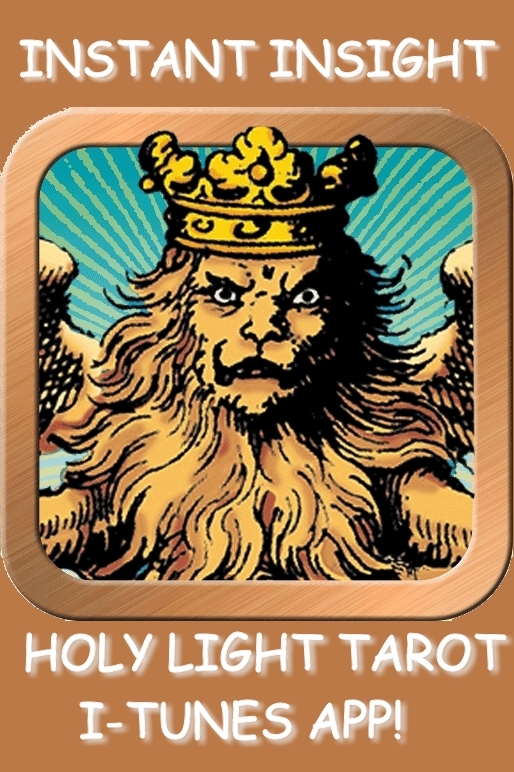 Enhance your enjoyment and understanding of your Tarot of the Holy Light cards, iPad or Android app. Full color on both sides, linen texture, just as they come off the press. ARTICLES AND REVIEWS OF THE TAROT OF THE HOLY LIGHT: Paul Holman, Mary Greer, Bonnie Cehovet and Stefan Laluna have given us very kind reviews at their blogs and at Aeclectic Tarot, and a thread has been launched at Aeclectic to talk about the deck. Another new review! This one from Adam McLean, woohoo! Thank you for the kind remarks, Tarot reading! Here are a few other reviews that have appeared recently around the net. The first is from Mary Greer, patron of all things Tarot. Thank you all for your fine responses to our Tarot! Psychic -- Yes this is the place where you can buy the Tarot of the Holy Light. If you are within the US or Canada, the cost is $26.00 postpaid. If you are anywhere else, there is an additional charge for the shipping and handling. You might also notice that we now also offer a signed and numbered copy for collectors. Thanks Casey, I look forward to your pack coming out soon as well!